Robo C2 Image download link. Discussion in 'Software' started by JohnShuba, Mar 19, 2017. As many of you know, there is no link for a download of a startup Raspberry Pi image for the Robo C2. If you call Robo support, they are nice people and real good at hardware support, but not so much at software support. They contact third parties to help with that. If you ask for an image of the Raspberry load, you will not get an answer where to download one. This make no sense to me since the main software loads on the Robo C2 are as follows Raspberry Pi is a open source OS, Octoprint is open source, Python is open source, and all the plugin to Octoptint can be downloaded from github and are open source. 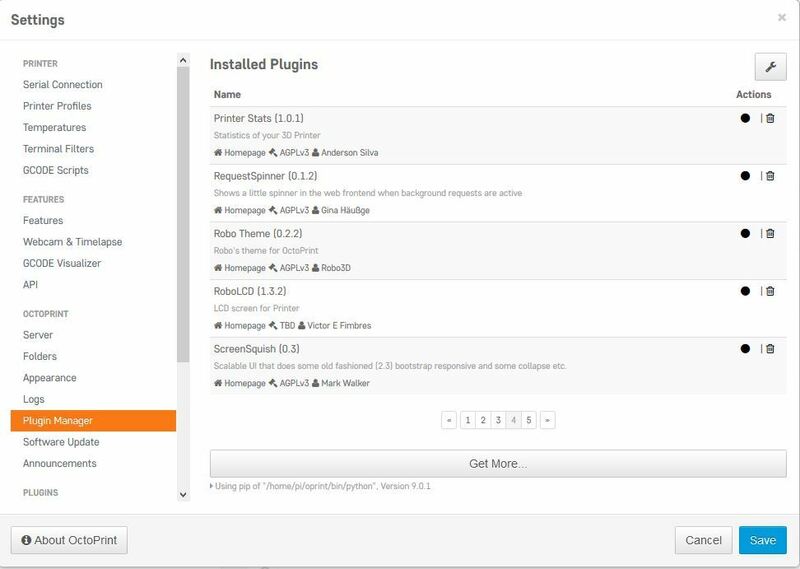 If you open Octoprints web page on your printer and go to Setting>Plugin Manager there is information on all the plugin and where you can download them from github. This is good to know because if there is a problem with an upgrade you can manually uninstall a plugin and then download and reinstall the plugin, this by the way usally resolves any issues. The fact is you could build a OS with all the required loads for the Robo C2 but that would take many hours of downloading, installing, and configuring. Why would any provider want anyone to do that when it is so much easier to restore an image to a SD card? Takes less than 10 to 15 minutes, and you would be guaranteed that the software load would be set to factory specs. With the help of @mark tomlinson whom shared an image with me, I have cleaned the image and upgraded it to the newest releases as of this posts date. So I would like to share the download of this image so that others may have it as a backup incase they have issues with a SD card and the OS on their printer. The image is based on a 8GB SD card load just like what comes from Robo C2 new. Use Win32 Disk Imager software to reload an image to the SD card and to create a backup of your image to your computer. Eric Albert, holmes4 and mark tomlinson like this. @JohnShuba thank you for your persistence with this effort. I fear you will end up being the maintainer of this task as Robo appears to be have no particular interest in doing this themselves. Even I have made a few attempts to streamline the process by trimming* the current RoboOS of all it's proprietary parts and all the parts that "phone home" but have not ever finished because of lack of time and frustration that Robo never documents anything they do. Finding the correct versions on their GITHUB repositories is also an exercise in futility. Sad part is that most, but not all of the things Robo has assembled into RoboOS are software projects forked from other people's work all as part of the OSS community. When you ask them for the source code, they ignore your requests and don't even point you toward their incredible messy repositories. I chalk it up to Programmers instead of a Program Manager being in charge of all their software efforts. * There is a lot of 'junk' code in the RaspberryPi image and there are things installed in funny (non-default) directories. I have an image currently running my R1 that has most, but not all of the Robo parts and I can fit it in less than a 4GB µSD card. It is missing the IoT stuff and currently the RoboLCD since it does a lot of things the R1 simply doesn't need and I don't want it to report back anything to Robo. Reporting back, no matter how innocuous without detailing exactly what you report back or allowing the user to opt out is a privacy issue and something Robo has likely not considered. I chalk it up to Programmers instead of a Program Manager being in charge of all their software efforts. Thanks a lot John for the effort on this. Just downloading a known working starting point is a huge help and one Robo has not put out there yet. @JohnShuba and @mark tomlinson thanks for making this. Revived my bricked C2. I can reimage a more current one later (maybe today even). Someone else might have one. robert trama and Geof like this. It is current as of today. This is an image from an 8 gb SD card so you need to use the same size (minimum -- larger is OK, you can resize it after you get it up and running to allow for the extra space). Do you think this renaming procedure will work with a R2 image? The images work exactly the same way, if it was a Generic image of the R2 then renaming the hostname works the same. And in reality the hostname is not a concern for the rest of the printer or printing process, it was just how Robo "serialized" each printer. It really doesn't matter what the host name is as you will only see that if you scan your network or if you look at the devices connected to your router. I think they use the name internally when the RoboOS dials-home to configure updates, but I don't know for certain. I do know that the unique naming was more of a concern for Robo than any user. Maybe, I didn't research any of the phone home stuff other than disabling the plugin when I realized it did allow Robo to collect information without telling the end-user what it was collecting and why, in my own personal opinion that is a highly unethical practice that too many companies use.